Pica la carne en pedazos pequeños y sazona con sal. Cocina el resto de los ingredientes, -NO LOS DE LA MASA- por 5 minutos. Añada la carne, permite hervir y luego baja a fuego mediano, cocinado por otros 20 minutos o hasta que la carne este tierna. LA MASA – Monda las yautias y plátanos y guayelos hasta que tengas una masa blanda. hecha un poquito de la carne y un poco del aceite de achiote a la masa y mezcle bien. En una olla grande hechas 5 litros de agua de sal, entonces hechas como 12 pasteles en el agua hiviendo, y cocinas como 45 minutos. Quítalos del agua enseguida que esten cocinados. Wash and pat dry the meat. Chop into very small pieces and season with the tablespoon of salt. In a large saucepan add the remaining ingredients (NOT THE DOUGH INGREDIENTS) and cook for about 5 minutes, then add the meat, bring to a boil, lower heat and simmer for about 30 more minutes or until meat is tender. Brush the leaf with a little annatto oil and place 6 or 8 tablespoons of the dough mixture in the center of a 12×12 piece of banana leaf which has been washed. ( these leaves can be purchased at most spanish stores and are pre-cut. But if you can not find them, you can use parchment paper, which is also available at the spanish market.) Spread the mixture in the center of the leaf and form a well in the center of the mixture. In the well; place 2 tablespoons of the meat mixture. Carefully fold the dough so the meat mixture is covered over. Then fold the leaf to form a rectangular shape and tie with string (tight enough where the mixture won’t come out of the pastel). Repeat this until all of the dough mixture has been used. There should be about 36 pasteles. In a very large pot, place 5 liters of water and 3 1/2 tablespoons of salt; allow to boil. 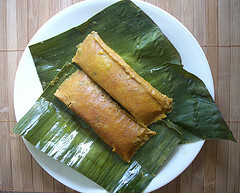 Place about 12 pasteles in the boiling water and allow to boil for about 45 minutes. Immediately remove from water once they are cooked. shop on line at BoricuaProduce.com in Chicago.